Dedicated experts deliver great service. Folding options only 1 cent each for any size! Promotional brochures are one of the most important marketing tools that businesses use to convey their value to customers. From a simple single sided flyer to trifolds, all the way to the impactful iron cross fold, PFL is the best printer for brochures and flyers that make your business stand apart. Our experts have over 200 years of combined experience in all aspects of print and they are ready to share that knowledge to help your business achieve your own brand of success. A brochure with the right touch from a custom finish will tell customers the value of your brand even before they read a single word. The look, the feel or the interaction with an interesting fold makes you memorable. The Look can be a striking metallic foil, Spot UV coating, a strongly branded Pantone color, or a die cut window. The Feel of a soft touch coating or a delicate emboss conveys a subtle, ingrained message of quality. The Interaction of unfolding an interesting piece gives you control of how your story is told to the customer, one step at a time. Foil applied to your print using heat and pressure can be shiny and metallic, or bright white and matte. We have holographic foil, scratch-off foil, colored and clear. We can help you imagine a way to make your logo, text or design elements pop right off the page. Learn more about foil stamping on brochures. Brochures can be embossed or debossed to make logos, text or images have a tactile feel to them. This can be used to great effect, making the brochure three dimensional engagement giving the customer something to touch and feel, increasing engagement. A 2011 study by researchers with the University of Southern California found that people are more likely to remember things they see when they also touch them. Learn more about using embossing on brochures. Die cutting allows you to add unique cutouts or edge shapes to your brochures. You could die cut text so the image on the panel behind the text peeks through or make your brochure into a unique shape. We can help you implement custom die cuts so your brochures capture attention and stick in your customer's mind. Learn more about die cut brochures. 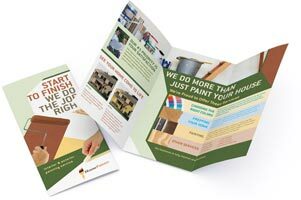 Folded brochures are the simplest and most cost-effective way to control the way that customers see your message. Each panel of the fold is like a storyboard or a movie scene. As the paper unfolds, the customer sees and reads your branding just as you hope they will. Many of our folds can be done for as little as a penny a piece. The classic trifold brochure is the most popular because of the ease of mailing, but bifold, accordion (pictured) and even more elaborate folds can be used in a variety of creative ways. Learn more about brochure folds. Brochures that meet USPS guidelines can be sent to customers and prospects as Self-Mailers so you don't need the work and cost of stuffing them into envelopes. We print the address right onto the brochure using Variable Data Printing (VDP). We can help you design a mailer that looks great, gets through the USPS intact and stands out in the mailbox Our Print Consultants can also help you determine the right size and postage to help you stay within your budget. Normal sizes work for normal occasions. But when you need to be different, when you are trying to stand out and get noticed, normal doesn't work. We can produce a wide range of brochure sizes, far beyond normal. 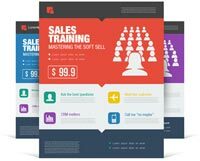 Learn about unique brochure sizes. Sometimes a more subtle effect does more that a flashy one. Using Pantone, metallic or scented inks can add classy creativity to your brochure, helping it get noticed and remembered. Add spot UV coating to accent the design elements you want to stand out, differentiating your company and product for enhanced brand recognition at a lower cost than foil stamping. Learn more about using custom inks on brochures. Brochures are meant to be held, touched and oohed and ahhed over. You can engage the tactile senses with special coatings like Soft Touch®. Coatings can also change the function, not just the form, of the brochure. With an uncoated paper or matte finish your brochure can be written on. A glossy coating makes images pop off of the page and helps it withstand smudges and dirt. Take a look at the specialty coatings for brochures. To get started on your custom print project, call our helpful printing experts now at 800-­930-2423 or Request a Price Quote. We'll get your quote to you quickly. There is no substitute for seeing actual physical examples of what we can print. Just let us know what type of products you would like to see along with your quote or Request Printed Samples. The most common size brochure is 8.5 x 11 inches, frequently folded into three panels as a tri-fold brochure. Other common sizes are the legal size brochure at 8.5" x 14", folded into four panels, and 11" x 17", folded in half to an 8.5" x 11" final size. The large 11 x 25.5 inch brochure is usually folded in thirds to a final size of 8.5" x 11". Can a brochure be made in custom sizes? We can help you make a brochure into just about any size or shape that you can imagine. In fact, we prefer to work on unusual and interesting brochures because it helps us better understand what can be done. What are some of the common ways that brochures are folded? There are many ways to fold a brochure to create interesting formats for displaying information. Other than the very common half or tri-fold, a few of the more popular ones are the Z or accordion fold, the open and closed versions of the gate fold, the half then tri-fold, and the double parallel or 4 panel fold. There are also several varieties of offset folds, where the panels are different sizes, creating a very artistic and eye-catching staggered presentation. In fact, you can see some of these folds in the video at the top of the page! 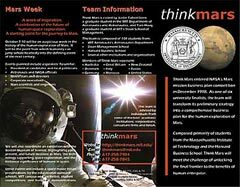 See the Brochure Templates and Folds page for more detailed explanations. Customers are 70% more likely to recall something they've seen in print, and brochures are one of the most affordable ways to get your message into print. What Counts as a Brochure? What types of paper can a brochure be printed on? They can be printed on almost any type of paper stock, from thin uncoated and gloss coated papers to thick cover stock that creates a very stiff brochure when folded. Our standard brochure papers are listed below, but there are many varieties available including recycled and SmartFlex® synthetic papers. Certain papers work better for particular uses, so check with our print experts for suggestions for your particular project. What custom options are available for brochures? There are many custom printing and finishing options available, including die cutting, embossing, foil stamping, flood or spot UV coating, matte or gloss aqueous coating (included at no extra charge), Pantone and metallic inks, scented inks, Soft Touch® coating, and many more. Can I have a perforated section on my brochure that can be torn off? Sure, a small section or entire folded panel can be perforated for easy removal. This is a great way to include a discount coupon offer, ticket, or other incentive to get people to interact with or visit your business while keeping the bulk of the brochure on hand for future reference. We can even create pieces that allow customers to return a card to you in the mail so you know that your marketing dollars are working. Can a brochure be used as a self-mailer? Yes they can if they meet the USPS regulations for size, thickness, addressing and tabbing. It's a great economic way to send a mailing as no envelope is needed, and your message or advertising is right on the outside. We have dedicated mailing experts who work closely with the USPS to ensure that our customers have the best possible experience with direct mail. Contact us for more detailed information on the requirements. Do you have brochure templates available? We have layout templates for our standard size brochures with common folds. Check with us for non-standard sizes and folds. Can you help me design a brochure for my business? Sure, we have experienced designers that will work one-on-one with you to get the best possible brochure for your business. And our rate is reasonable. Check out our brochure fold and layout templates if you need help creating your company brochure. Templates are available for all the standard brochure sizes and folds, as well as free pre-designed brochure templates for Microsoft Word. It's easy to replace text, logos and images with your own custom information for a professional looking brochure design. The most important part of print marketing is to include a 'call to action' that prompts your customer to do something, so design your brochure with that purpose in mind. If you want the brochure to get noticed, use striking, bold art work. Touch it up with special, custom effects like foil stamping, embossing and special coatings. If you want people to write on your brochure, don't coat it in a glossy finish. If you want to really stoke engagement, use cool folds that call out for someone to open the brochure. Once you have a purpose in mind, the next thing to consider is how the brochure will be folded. A tri-fold brochure is the most common, by far, but you can go much further. Here are some examples. Learn more and get templates. Not sure about designing your brochure? We've got your back. Design can be tricky. Let our team of experts make sure your brochure's design is eye-catching and attention grabbing using custom printing and finishing options. Our highly qualified graphic designers will work one-on-one with you to create custom pieces that show your business off and astound your customers. Did we mention custom design is wallet friendly? Call 800-­930-2423 now and let us quote your design project. I've worked with printers for over 28 years and I have to compliment you on the wonderful job you did on my brochure, cards and stationary. The process was user friendly and very smooth. Not a glitch. People always ask where I had the printing done, and I am passing on your name. The tri-fold brochures you printed for us look fantastic, and I am thrilled with the outcome. Also, I want to compliment your service and the efforts you all made to ensure that the final product turned out perfect. The guidance you provided me regarding the selection of the paper stock and finish was invaluable. Thanks for being so dependable and having great customer service. You guys rock, seriously. The brochures we printed on short notice got here on time and looked amazing. You guys make designing for print easy. I received our order yesterday, and I just wanted to let you know how happy we are with the brochures and your company. The pieces look spectacular and Lori was so helpful every step of the way. You made a stressful time much easier for me, and I found all of the help and answers I needed. Thanks again for the best service available, fast turn-around, and quality printing. I will certainly look to you in the future, and confidently recommend others to give you a try. Just to let you know we got the brochures yesterday and they look beautiful. The client and all her team were very impressed with the printing and paper quality and the packing. As an industrial graphics artist I am pretty fussy about print quality, paper and such. I always want to "wow" my clients. I really considered that I was taking a risk by placing an order from an online printing company and purposely chose a small order that was not time sensitive and that I could afford to replace with my normal printing source if I wasn't satisfied with the outcome. Using your website, I tracked the order all the way to my door. Sorry about the skepticism. My order just came, and I am stunned with the high quality. It usually takes a lot more to impress me than it does my clients. After all, I see this stuff every day. You guys did a great job. Guys, wanted to thank you again for your help with the recent trifold brochure order. Your help with the order process, direct mailing, and working with me on rebuilding the file to get the perfect blue....was all very appreciated. You guys set the bar. Thanks again. PrintingForLess did so much more than I expected. The professionalism of the Red Team was outstanding, and our designer, Hannah, is a genius. She took our verbiage and rough ideas and turned it all into a beautiful and compelling brochure. I have just returned from my big make or break trade show debut in Chicago and I wanted to thank you! It was a complete success, and I couldn't have done it without you! Everybody liked the brochures. You were so helpful - the brochures came out beautifully. The advice was right on the money! The shipment arrived and was waiting for me at my hotel Saturday afternoon - just in the nick of time. I was so relieved! I can't say enough how ingratiated I am. Sometimes, you know, getting the support you need is so much more valuable than price alone - this is one of those instances where EVERYTHING fits. No one should hesitate to get this kind of job done "on-line". The brochures looked awesome! Thanks!! Really glad that you have the online proofing process - streamlined, easy and very useful!! Why are you making a brochure? Marketing either drives a specific action (call you for a consultation, come in and make an order, etc) or trying to drive awareness of your brand. A brochure can do both - often at the same time - because there's so much space on the brochure itself and because it can be divided into discrete panels by folds. Think about what you want the marketing to do, then design everything about the brochure around that idea. Brochures can be folded in interesting, engaging ways. These interesting folds make all the difference because it means someone holds your marketing material that much longer, engages with it that much more deeply and recalls it more easily. Keep your brochure simple and on point. Give only one, clear, easy-to-act-on call to action. Don't tell customers to call you and go to your website. Just pick one - and consider picking a call to action that's easy for you to track and measure. You want to know how much bang you get for your buck. Design should be clean and easy to read. A brochure is a tool, and reading it is how you use the tool. Would you use a power drill that took 10 minutes to power up? Why would someone read a brochure that has the important stuff hidden under a bunch of junk graphics? Keep it simple and it will be more effective. Keep your messaging to as few words as possible, and use images or graphics to inspire. Marketing gurus will tell you to never lead with features - always talk about the benefit of your product, solution or offer. Focus on how it will make your customer's life better, use that hook to explain what it does. But, brochures have a place as a feature-list. If you're in need of a quick and effective way to get your product's features front and center, a brochure will do the job. In general, however, always lead with benefits. Make that the focus of your marketing. If you are including an offer, URL, or phone number on your brochure, try to make it unique for that brochure. That way you can track all the calls to one specific number or all of the emails to one address, knowing it came from that brochure. The fun thing about print marketing is, once you put something into the world you don't know where it will end up - you may get calls from people that you never targeted but are great customers anyway. Use the same brand colors, logos, slogans and general look and feel across all of your marketing. Don't make a brochure that looks wildly different from anything else you've done - or at the very least, include your standard logo on the brochure. Keeping your brand consistent will make it easier for potential customers to remember and find you later, when they are ready to buy. This seems like an obvious question, but you should know how many brochures you're going to need before you order. The more you order, the cheaper they are - so don't sell yourself short. Likewise, don't order too many, especially if you're bound by a time limit (like a tradeshow or special offer) or if you just don't have the storage space to keep them all. Why use PFL for your Full Color Brochure? So what goes into the cost of printing brochures? Several things can affect the cost. All brochure and flyer printing comes with 4-color printing on the front. The second side can be ordered also with CMYK 4-color process, or with black ink or left blank. Pantone or metallic inks can also be used on request. Plus, we provide free aqueous coating and offer UV coating on our gloss papers. Aqueous coating adds scuff-resistance, extra sheen and helps protect the piece in the mail. Gloss UV coating adds an ultra-shiny and protective finish for a "rich," high-end look and feel. The number one thing that changes your cost is the type of paper you use. Premium papers have a more luxurious feel, but they cost more. Typically, thicker papers cost more too but our print consultants can help you pick the right paper that fits your budget and purpose. Paper is really important to a brochure because the paper determines how the brochure handles being folded, it literally changes the structural integrity of the piece. All of the paper we use at PFL is top-of-its class - we refuse to use cheap, crappy paper that can't hold ink, fold properly or stand up to everyday abuse. Even if you choose our affordable option, you're getting quality paper. Adding custom effects like metallic ink, foil stamping, die cuts, embossing and debossing will add cost. Some effects cost more than others, especially die cutting and embossing which usually requires a custom die to be made. Our print pros will help you make the decision about using custom effects. We want your marketing to work, so we'll tell you if we think custom effects won't make a difference for your project. Because of the initial setup costs associated with offset printing, the more pieces you print, the lower the cost per piece. It's quite a bit cheaper to print a larger quantity once than half that quantity twice, so print as many as you think you can use before you'll have to change the content of your piece. Need a custom printed holder or display for your brochures? Try our brochure holders that can be custom printed to compliment your brochure and enhance your branding. A well designed, beautiful brochure can't work for your business unless you are able to get it to potential customers. Direct Mail is a time tested and proven way to reach people. If you've ever spent time addressing, stamping and stuffing envelopes (PTA, Church, Political Campaigns - we're talking to you) you know that it is a tremendous investment of time. We have machines that help keep your costs down and get the job done much faster and with no paper cuts. Our team can insert pieces into envelopes, or wafer seal a small catalog and stamp things at a faster rate than your most dedicated team of volunteers or employees. Want to grow your customer base? PFL can help you identify your target market and find a targeted mailing list that will work for your business. Call us at 800-­930-2423 for list information and costs. Use our handy Direct Mail ROI Calculator to see how easy it is to increase your business. As your one-stop shop for printing and mailing, you can price and order your direct mail piece right on the brochure ordering page. On the ordering page, enter your print Quantity in our InstaPrice® calculator and select your options. Enter the quantity of brochures to be mailed and your preferred mail class in the Mailing Services section to get the price including mailing. Informative brochures are a great way to educate your customers about your specific products or services. By presenting lots of useful information, your customers will feel more confident and empowered to make the right choice, increasing sales. 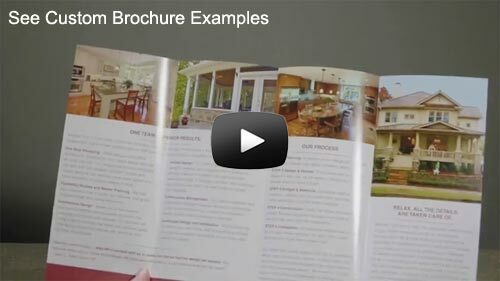 Learn how to create brochures and prepare them for printing. The large 11x17 half fold brochure format serves as a small catalog and uses the additional space to provide more comprehensive product descriptions and company messaging. Read the review of this 11x17 half fold brochure and see previous featured brochure designs. Do you need some help turning your ideas into a reality? We can help answer any question you may have about unique sizes, custom inks, and papers for your full-color brochure project? Just give us a call at 800-­930-2423. Need pricing for custom options? Feel free to Request a Quote. Your brochure is a key tool in your marketing toolbox. Don't leave it to chance, or cut corners just to "get one out there" and hope it connects to your customers. Give us a call, and speak to one of our experienced and dedicated pre-press teams about creating a high-quality, full color company brochure. Paper choices, sizes, folds, files, images, mailing and design—we do it all! Let us help you create a professional full color brochure to reach your customers so that you can focus on running your business. Check out our brochure fold and layout templates if you need help creating your brochure in the graphic design program of your choice. Templates are available for all the standard brochure sizes and folds. We also have a selection of free pre-designed brochure templates for Microsoft Word. It's easy to just replace the text, logos and images with your own for a professional looking brochure design. "I've been meaning to get back to you about our extreme satisfaction with the brochures. The whole team was impressed with the print quality and the depth of color. We will definitely be coming back for reprints and future publications." Our sales team was waiting for these to get their new campaign going and they were thrilled with the quality of the printing. For my part, I appreciate the level of customer service I've come to expect from you. It's refreshing to work with a proactive vendor and I look forward to doing business again when we have another project.